We Californians are in the midst of a historical drought, the worst in fact since weather data was first collected and compiled in the mid 1800s. You may be asking “Why are we still watering lawns?” I ask myself the same question. Recently Mother Jones published this article about the California drought and what we can do about it. Santa Barbara landscaping serves the architectural tradition of our famously beautiful city – gorgeous architecture calls for equally stunning gardens and landscapes. The only problem is that we modeled our idea of beauty from the old Scottish lawn tradition where it rains all the time. Here in paradise, our average annual rainfall is somewhere around 18 inches per year, just 8 inches higher than an official desert. With a state of emergency declared by Governor Brown, and most of the state experiencing extreme drought, there must be something that we can do. There is, and the place of greatest impact is at your own home. For starters, have you ever seen sprinklers going off in the middle of a rain storm,? Or just before? Or right after? 1) Turn off your irrigation controller a few days before a rain event and leave it off until the soil begins to dry. This is often a few days to a week+ after the rain event depending on the amount of rainfall. This is one of the most basic and commonly overlooked ways to conserve our water, the majority of which comes from Lake Cachuma as collected rainfall, as opposed to water bought from the sate. The only problem here is the possibility for human error. Are you going to remember to turn your water off? This brings us to #2. 2) Install an on-site weather station. If your irrigation controller (clock) is not more than 5 years old, it most likely is compatible with an on-site weather station. For a modest investment, these stations measure temperature and precipitation and adjust your irrigation scheduling automatically, including shutting it off during and after rain events. Consult your landscape professional whether your controller is compatible. If not, it is safe to say you will break even on your investment on a new controller with a weather station in one to two years with savings on your water bill. On-site weather stations allow you to program your controller for each area of your property depending on shade and sun, slope, soil type, irrigation type, etc. This is one of the best ways to maintain the health of your plants, as the station calibrates for the ideal amount of water for your particular micro-climate. 3) Change your sprinkler nozzles. The nozzle is the emitter on top of the sprinkler that controls how much water is released. The newer rotor nozzles deliver much less water over a longer period of time, eliminating over watering, flooding and run-off all too common with the fixed spray nozzles. If you are committed to your lawn, this simple measure has been shown to save water usage by 30%. 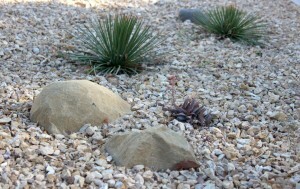 4) Replace your lawn with drought tolerant plants or food producing plants, or both! There are so many plant choices in our forgiving Santa Barbara climate with nearly 300 sunny days per year. Choosing between California Native plants, drought tolerant Mediterranean plants from around the world or desert plants and succulents is a matter of taste, matching existing landscaping and the home’s architectural style. And try this one on: if you are going to water, why not grow something you or someone in the community can use? Have you ever thought of replacing a lawn with a kitchen herb garden, vegetable garden, fruit trees or combination of the 3 in a food forest? Food producing plants can be installed with just as much attention to beauty as ornamental plants, though you get more than beauty in return. Experience the joy and health benefits of growing some of your own food, or donate it. There are programs like Backyard Harvest that will harvest and put your bounty to good use within the community. Tune into my next blog where we’ll go further into lawn alternative plant choices to reduce water use and enhance the beauty of your property. We serve the greater Santa Barbara area including Goleta, Montecito and Carpinteria.